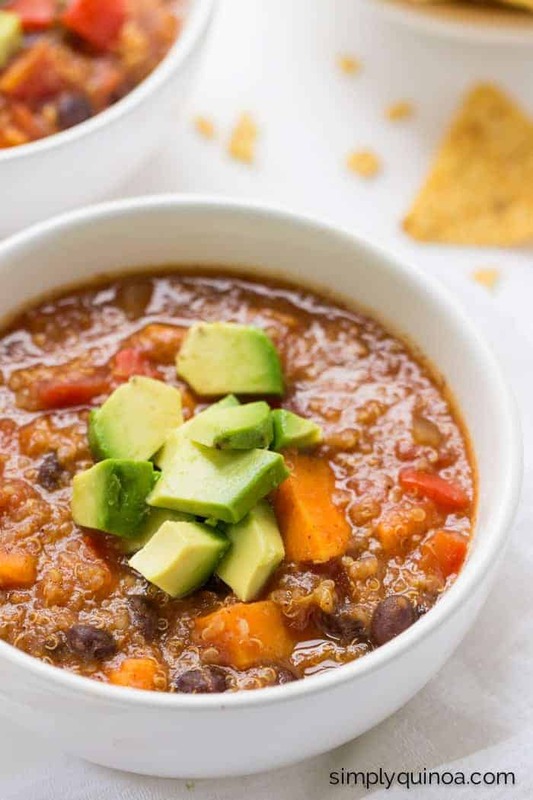 Try this healthy, vegetarian quinoa chili with chunky sweet potatoes and hearty sweet potatoes. The best part? It's made in a slower cooker, so it's easy and mostly hands-off! Well, it's time my friends. Time to turn on the slow cooker. Time to pull out those chunky sweaters from the back of the closet. 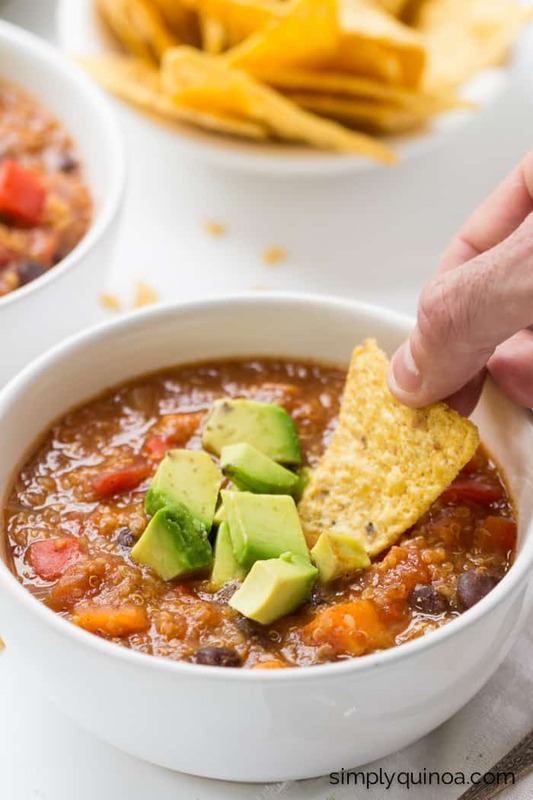 And time to cozy up to a big bowl of chili. Because apparently there's some sort of hurricane coming towards the East Coast right now and it's makin' things pretty darn miserable out there. A hurricane? really? Yep, it's definitely chili time. There's nothing that will warm you up faster than a bowl of this. Why? 1) LOTS of sweet potato. 2) black beans. 3) lots of spices. 4) vegetarian. 5) slow cooker. And the last one might just be my favorite. See all those goodies in there? 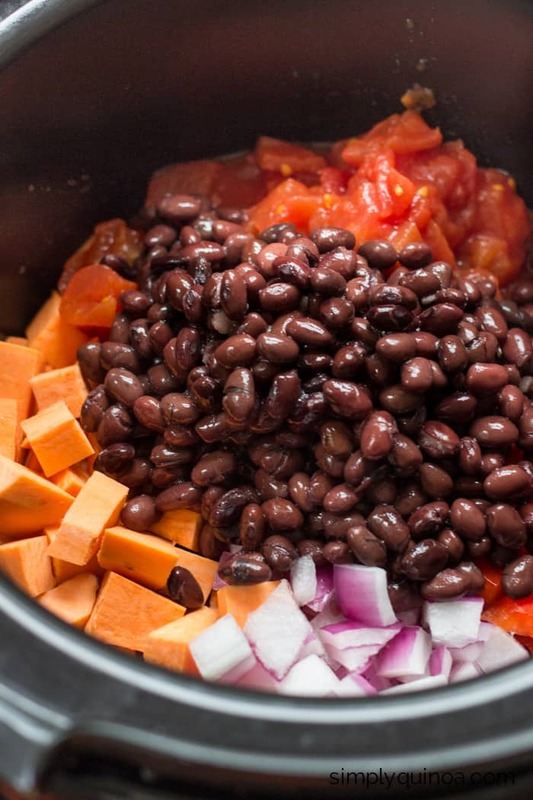 The spices, baby bits of quinoa, beans, and chunky sweet potatoes will slowly meld together and turn into the most spectacular chili EVER. One thing to mention is that it might seem a little thin or liquidy at first, but as it cooks the quinoa will also cook, absorbing a lot of that liquid and helping the whole thing get nice and thick. I mean…it's hard to resist, ain't it? Also, while totally optional, the cubed avocado (or better yet a big ol' dollop of guac) and tortilla chips are phenom. It makes it feel a little bit like a slice of Mexican heaven, perhaps taking your mind off that fact that it's cold and miserable out. So excuse me while I go dig into my leftovers. I'll be on the couch, with a giant bag of chips next to me, pup at my feet and a big bowl of quinoa chili in my lap. Happy Sunday friends! PS: if you make this recipe (or any others!) make sure to snap a pic and share it on Instagram using hashtag #SIMPLYQUINOA – I want to see your creations! Yep, it's definitely chili time. There's nothing that will warm your up faster than a bowl of this. Add all ingredients into a crock pot (starting with just 3 cups of broth). Turn on high and cook for 4 hours, turn down to low and continue to cook until ready to serve. If too thick, stir in another ½ – 1 cup of water. Serve with diced avocado (or guac) and tortilla chips. It’s such a good combo! 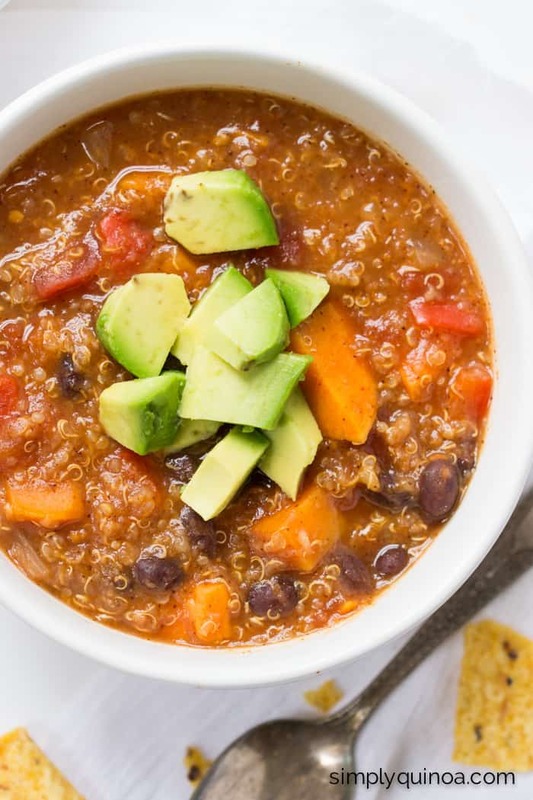 My favorite quinoa chili recipe on the site! 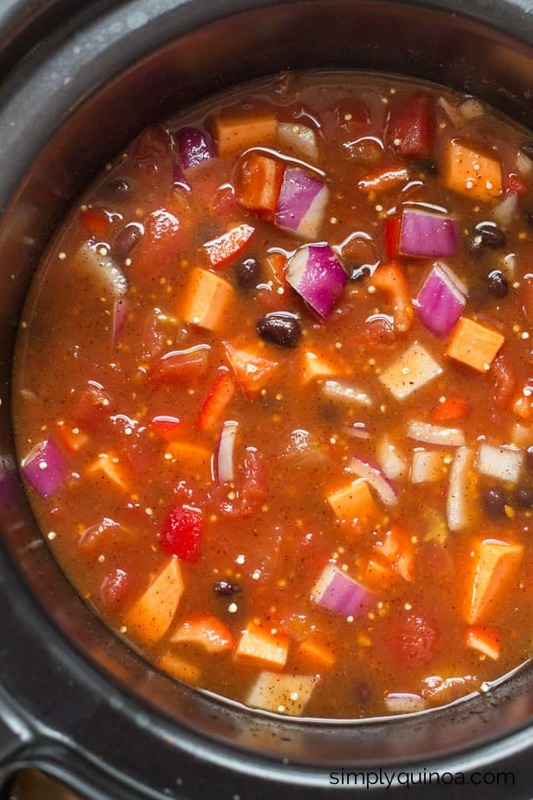 This is made in the slow cooker, is packed with protein and has so much flavor! Add all ingredients into a crock pot (starting with just 3 cups of broth). Turn on high and cook for 4 hours, turn down to low and continue to cook until ready to serve. If too thick, stir in another 1/2 - 1 cup of water. Serve with diced avocado (or guac) and tortilla chips. It's such a good combo! *If you don't have the option to turn your crock-pot down after four hours (like you're at work), just leave it on low for 6 - 8 hours and the results will be the same. I was wondering what the serving size is? Is it a cup? 1/2 cup? the nutrition information is per serving but it doesn’t say how big a serving is. thank you. Made this for my vegan date last night and we both loved it. Thank you for posting! This receipe is awesome and super simple.My husban and our son love it. Greetings. Your recipe looks like something I can cook for my mom, she had stage 4 lung cancer, and I would like to make this for her as part of her meal prep. However, we don’t own a crock pot… Can this be made on the stove? Thank you. I made this last night in an instantpot for lunch for today. It’s actually very good! Next time I make it, I’ll add some finely chopped habanero (I like extra kick), but as is, this recipe is a winner! Thanks for sharing! So glad to hear it worked in the IP! I don’t own one yet, so I love hearing when people test out the recipes in it! I have the same issue. Cooked on High for 4 hours, set to low for an hour and the sweet potatoes are still kind of crunchy. Also I only used 3 cups of broth but I feel like its very soupy. Is that normal? This is my first time making a vegetarian chili so I’m not super sure what to expect. It’s very flavourful though! Hmm maybe your crockpot doesn’t actually get that hot. When mine is on high, it’s on a low boil which will definitely cook the potatoes. Maybe transfer it to a pot and just boil it for another 60 minutes or so? Hmmm that’s strange! Was it really cooking high when you looked at it? Like bubbling and boiling? I’m wondering if maybe your crockpot wasn’t super hot? It should definitely cook in that amount of time! This recipe made regular rotation in my house! I did not cook it in the slow cooker. I sauteed all the veggies (I added about 1/4 minced jalapeno) with the spices on my stove on medium in the dutch oven for about 10 minutes. I then added the rest of the ingredients, covered and let it slightly simmer for about 45 minutes to an hour and I would open it occasionally to check consistency and stir. I topped with avocado, cilantro, fresh lime juice and a small scoop of plain greek yogurt, served with a side of basic salad. Did not miss the meat! Was even better as leftovers for lunch. Thank you! This look so good! I need to make a big batch to have some in the freezer for busy night. Can quick cook quinoa be used? I just made a batch today and it was DELICIOUS!!!! I would not change a thing .. it was perfect! I will be making this often for sure!! Thanks for sharing!! Hooray! This is probably the recipe I make most from the blog! Will this work if you cook on low for 8 hours instead of high for 4? 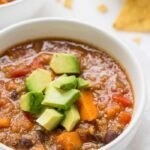 Have you tried this in the instant pot?! Anyone done this in the instant pot? How long would you cook it? Making this tomorrow but won’t be home after 4 hours to turn it on low. Suggestions on timing? I can set my slow cooker to high or low. Then it automatically goes to warm when the time is up. Thanks! Can i use this cold at a party as a dip for tortilla chips? Definitely! I might just chop the sweet potatoes up a little be smaller so they’re easy to have with chips! Is the sodium accurate on the nutrition panel? Over 1000 mg? Based on the nutrition plugin, yes, but if you drain and rinse your black beans, I think it will dramatically decrease! I’m wondering if anyone’s tried making this recipe with dry black beans? I’ve read you can do this in chili recipes with no pre-soaking, but haven’t tried it myself. Maybe it would require adjusting cooking times? Haven’t tested it personally, but I imagine it will take quite a bit longer to cook! Do you have the nutritional facts per serving. I found this in Whole Foods and I’m going to try and make it. Delicious…thank you for the recipe. Do you rinse the black beans? Just finished making this and currently enjoying a bowl on this chilly day in Toronto! 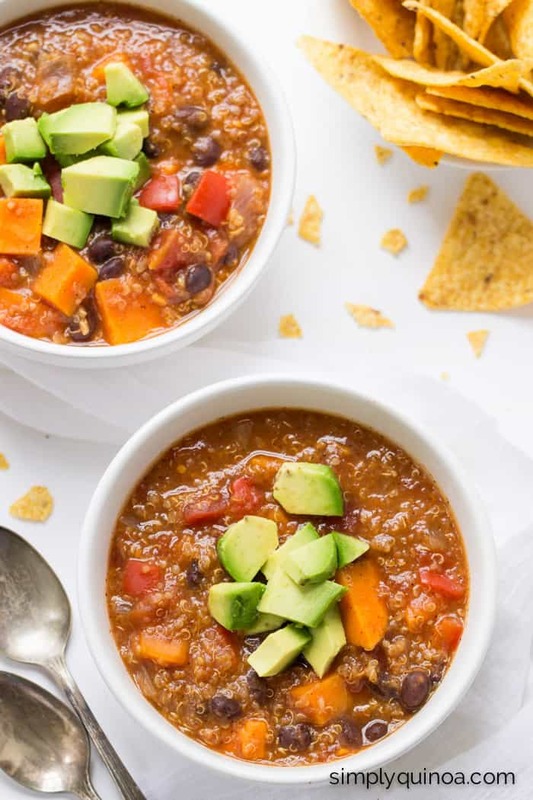 I love how easy this recipe is, and for someone who makes large batches and freezes portions for lunches this is perfect! I didn’t have any sweet potato on hand so I used acorn squash and it was still great. Thank you for the recipe! I made this tonight on the stovetop and used spiral cut sweet potato instead of chunks, added several handfuls of kale, and some garlic. Absolutely delicious! Made this today for Meatless Monday! Really tasty and would definitely make it again! I made it this recipe over the weekend and it turned out absolutely perfect! So glad you enjoyed!! One of my FAVES! This was the first time I have made a vegetarian chili and it was outstanding. It was especially tasty with the avocado and tortilla chips. A family favourite!! So glad you enjoyed it! We’re experiencing -10ºF weather right now and I’m thinking a big pot of this is perfect! I keep hoping to find a crock pot at a garage sale or on eBay, my Mom used one often but I don’t think I have one. It seems very worth getting, I love the idea of starting a meal in the morning and it being ready later – I tire too easily & really miss cooking so much. This looks flavorful and filled with good nutrients! Thank you for a great looking recipe! Now I need to find some vegan cornbread. (So sad that the old Jiffy 79 cent stuff has animal fat!) Surely someone has something. If I don’t have a crock pot, can I use a regular pot? I don’t see why not, especially if you can adjust the cooking time? I like the idea of the slow cooker though, since this is one of those meals that is often better the second day – so I imagine cooking it for 6 hours would let all the flavors really mingle and get yummy. We’re trying this for dinner tomorrow. Can’t wait! This looks good! I must try it. And yes, I must also find my sweaters that are packed far away. It’s cold out there! Hope you give it a try 🙂 Let me know how it turns out! Made this today and SOO good! Slight mods: I don’t have a high tolerance for spice so I lessened the “heat”. I added 1/2 can of sweet corn. And served it topped with grated sharp cheddar (which promptly melted- delicious) and toasted rye. Took a mouth watering pic but can’t figure out how to attach 🙂 Thank you! !